As a promotional strategy, healthcare marketing should utilize different marketing channels and tools to create, optimize, and share valuable, branded health-related content that doesn’t just help teach and promote public health information, but also promotes the particular healthcare brand publishing the content. This is a patient-centric approach to marketing, as you aren’t just promoting a service, but are providing valuable information that instills trust in a patient and helps build a long-lasting relationship. From an online standpoint, healthcare marketing delivers results by helping your website rank higher in the Search Engine Result Pages (SERPs) for prospective patients’ search queries — in order to improve patient acquisition. Different tactics, such as Search Engine Optimization (SEO), social media marketing, content marketing, online advertising, and others are utilized to accomplish the desired results — getting new and high-paying patients to your practice. That’s why healthcare marketing experts can also call it patient acquisition marketing or patient-centric marketing. Modern healthcare marketing is a value-based, patient-centric, and cost-effective approach to promoting a healthcare brand and its services. It allows you to create personalized marketing campaigns for targeting prospective patients based on their online interests, behaviors, and actions. Not just that, but the analytics tools and technologies in healthcare marketing also make it trackable and measurable — which means you can easily keep a track of all your marketing campaigns at every stage and also measure and analyze the results to optimize your ROI (return-on-investment). To maximize the benefits of healthcare marketing, you need a healthcare marketing strategy that will help you get the most out of your healthcare marketing efforts. What Is a Healthcare Marketing Strategy? A healthcare marketing strategy is a documented plan of action that lays out various opportunities and threats, and all the resources that the healthcare business intends to utilize in order to realize its final goals. Leaving the other details aside, a healthcare marketing strategy aims at finding and acquiring new patients on an ongoing basis. It also helps create engagement opportunities to nurture your existing patients to develop long-lasting relationships (patient retention). All of these are done in order to develop a sound outline of the different short-term and long-term goals and objectives and the different strategies and methods to accomplish them. 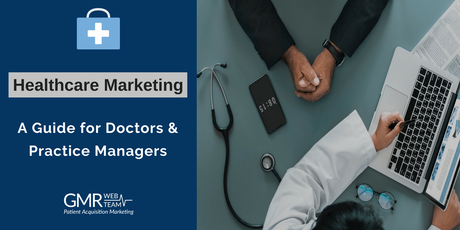 The “3 pillars of healthcare marketing success” is a healthcare marketing strategy designed by the healthcare marketing professionals of GMR Web Team to manage the overall performance and growth of your practice. This plan helps in acquiring more patients, improving patient satisfaction, and building a robust online presence and reputation. Implementing this “3 pillars” approach in your healthcare marketing plan will result in improved patient service recovery, retention, and acquisition. Gone are the days when a one-way, unquestioned and non-interactive communication of your services (TV, radio, newspapers, etc.) are sufficient enough to grow your patient base. Today, as patients have become smarter and information-empowered non-interactive traditional advertising tools have become obsolete. New patient-empowering channels and tools have taken center stage to meet modern patients’ demands of learning everything before choosing a healthcare specialist. According to a study by Pew Research Center, 80% of online users look for health-related information online, whether it’s to learn about their health condition or choose a healthcare practice or provider. With a website that’s optimized for your target group of potential patients, you can set your practice up to attend to patient questions. You’ll need to optimize your website so that it only attends to the needs of specific types of patients who are your direct consumers. Treat your website like it’s your virtual office. It also serves as a primary online touchpoint where you’ll attract potential patients looking for a provider. An optimized healthcare website will also act as a touch-point to establish an interactive communication line with existing or potential patients through features like user sign-ups, appointment form fills, complaint submissions, direct calling, practice location directions, and many more. Simple and easy to navigate – Your website should have a clear and simple design that’s easy to understand and navigate. It should contain elements such as clear navigation menus, large CTA (call-to-action) buttons (i.e. call now, schedule an appointment, etc. ), and is scannable with a search bar feature to enable patients quickly find the information they are looking for. Trust enhancing – Provide relevant information your potential patients are searching for. Create quality content that resonates with your patients. Be sure to include a local phone number, patient reviews, and testimonials to increase credibility. Mobile optimized – Make sure your healthcare website is optimized for mobile devices. Being mobile-optimized means a website can reformat itself for a list of handheld devices, including smartphones. Reformatting allows your site to show up with larger navigation buttons, reformatted content, and differently optimized images – all of that collectively provide a seamless user experience to the patients visiting your website through mobile phones. Search marketing Solutions like SEO (Search Engine Optimization) & content strategies work together to create a robust online presence for your practice by attracting more leads and conversion opportunities online. One of the primary goals of an SEO & content strategy is creating useful and relevant content that answers patients’ questions. It’s done by incorporating patients’ search terms or providing solutions based on patient’s search intent** in the content to help it rank on Search Engine Result Pages (SERPs). According to PwC’s consumer survey of 1,060 U.S. adults, more than 80% of individuals ages 18–24 would be likely to share health information through social media, while nearly 90% of individuals would engage in health activities or trust information found via social media. Taking advantage of this calls for an active and robust social media marketing solution that focuses on improving patient engagement through online community building efforts. That way, you can easily reach those 80% individuals looking for healthcare information on social media and engage them in an active conversation with your brand. Patient education & experience: Patients get to interact with fellow patients, and providers are able to offer health and wellness advice to the general public. An information resource to caregivers: Caregivers are your most valuable healthcare partner after patients. They can utilize your social media patient community to connect with other caregivers and get answers to any logistical questions they may have related to finance, living arrangements, legal, and other advocacy concerns. Improving health outcomes: Patients interacting with other patients for learning various health management tips can improve health outcomes. Try imparting healthcare education through video content primarily as they drive better interactions. Remember, the success of your social media strategy depends on understanding and delivering what your patients need, and solving their problems. According to a recent survey by Software Advice, 82% of patients use online reviews to evaluate physicians. This indicates that a stellar healthcare online reputation is essential to attract new patients from the internet. If the online reputation is your goal, reviews and ratings are the strategies you’ll need to implement for achieving that goal. Online reviews are so crucial that they can persuade patients (48% of them, according to the Software Advice study) to go out-of-network to select a provider with better reviews. Positive review acquisition – Encouraging patients to write and submit genuine reviews online. Negative review protection – Allowing you to identify unhappy patients as they leave a negative remark and enact a robust service recovery process in due time to recover them as a patient. Patient sentiment insights – Providing a deep insight into the patient experience by helping you understand your patients’ emotions and feelings during their visit. Reputation monitoring – Receiving immediate notifications when your patients post a review online, whether positive or negative. Patient service recovery – Reaching out to the unhappy patients immediately and performing service recovery process to retain them. Practice management insight – Granting a varying degree of access to fine-tune your management workflow, including monitoring staff performance and activity. The healthcare reputation development process starts with identifying its need, then moving on with collecting patient reviews and performing data analysis process to understand various dimensions of prevailing patient experience and satisfaction at your practice. As you move on with the review analysis process, you start identifying patterns regarding your areas of improvements that ultimately help in exploring ways to improve patient satisfaction – a crucial factor for the success of your healthcare practice in this age of value-based healthcare. Marketing automation is defined as the use of control systems and information technologies to reduce the need for manual efforts in completing some repetitive and routine, but essential marketing campaign management tasks. Using marketing automation tools for purposes such as email outreach campaigns, social media scheduled postings, review collection and service recovery, etc., ultimately help by reducing cost and improving efficiency and throughput. With marketing automation tools like Aweber, you can send direct emails to your patients to help them take care of their medical conditions or remind them of routine health checkups or to make appointments. Other tools like Hootsuite lets you schedule a post on your social media accounts at a later date, which is an opportunity to easily manage your social media accounts at your leisure. All of this help in personalizing communication with your existing patients or your prospects by delivering timely and relevant messages to them that helps in nurturing patient engagement — a crucial factor for increasing positive outcomes, improving patient satisfaction, lowering your cost and maximizing revenue at your practice. The only caveat while using automation techniques like direct email marketing is the patient privacy guidelines laid down by the Health Insurance Portability and Accountability Act (HIPAA). HIPAA places restrictions on disclosing a patient’s identity and information about their specific health condition in a promotional mail or social media post or anywhere without their written permission. Failing to abide these can land you finance and court-related troubles. Google Ads – Google’s search and display ad options let you create and run ads for your practice so that your practice can instantly appear on top of the search results for relevant patient searches, and on other third-party websites that fall under Google display network. Facebook/Twitter Ads – Allow you to target a specific audience group based on demography, interest, behavior, location, and many other factors. YouTube Ads – Online video marketing is the new trend. You can advertise your practice through YouTube ads that appear as suggested videos, banner ads, in-stream video ads or in-video overlay ads. Retargeting – This is like a magic tool in online advertising. With retargeting, you can target those individual patients with your ads, who have previously shown their interest in your brand or service through a visit or action on your website in the past but didn’t took any converting action. Effective online advertising combined with your SEO strategy help you grow your practice by placing it in front of your target audience and ensuring that your healthcare brand messages are actually seen, and stay on top of your prospective patients’ mind. Online advertising from social media advertising to search engine ads help you boost high-quality and relevant site traffic and generate instant leads. Measuring and analyzing the results of your healthcare marketing campaigns is essential to track their effectiveness. Specific metrics help you measure whether your healthcare marketing strategy is effective in achieving the marketing goals you have set, or whether you need to change that strategy. Website and blog traffic – The number of visitors on your website and the amount of time they spend on specific content indicate whether your content resonates with your patients or not. Social engagement – If people are liking, sharing, re-tweeting, and/or commenting on your social media updates, are they finding your content interesting and useful? Inbound links – Whether you are getting enough external links to your website from authoritative sites such as healthcare publications, local, or national news, or a healthcare influencer’s site, in order to improve your site’s search rankings significantly. Brand awareness and reputation – Checking your ranking on search engines and your reviews whether positive or negative will help you measure your brand awareness and reputation. Conversion – Sign-ups, calls, appointments scheduled, etc., help you measure and analyze the revenue or profit you are getting from your marketing efforts. Healthcare analytics help you keep a track of everything about your marketing campaign, including the returns on your marketing expenses. Another great way healthcare analytics helps is the predictive analysis of the data that lets you identify the likelihood of future outcomes based on historical data. What problems can healthcare marketing solve? Actually, many! Healthcare marketing solutions can help you acquire new patients on a regular basis so that your practice can achieve a profitable growth. Moreover, it can assist in the overall growth of your practice by improving its performance at providing high-quality patient experience and customer service. Healthcare marketing also strives to build your strong professional reputation among community and peers that alone can keep you winning professional referrals to help you transition to an “all-referral” business. What is the role of a provider for making a healthcare marketing campaign successful? As providers are the closest “touchpoints” for healthcare consumers, they have a huge role to play in making a healthcare marketing campaign successful. Providers who have a dedicated system to collect patients’ demographic, social, and behavioral information, as well as their sentiment data, can help marketers design more effective marketing campaigns for the specific target groups of patients. What are the challenges in healthcare marketing? Departmental silos – This prevents delivering a consistent patient experience and communication within different departments of your practice. Keeping up with the latest trends – Keeping pace with the digital world and the latest healthcare trends and technology is essential to beat the competition. Meeting the ever-growing expectations of patients – Staying one step ahead of your educated and empowered patients will help in improving patient experience and satisfaction. Adhering to the HIPAA regulations – Failing to protect patients’ Personal Health Information (PHI) during situations like responding to patient issues publicly can invite unnecessary financial and/or court-related troubles. Is healthcare marketing all about advertising? No! Advertising is only a small subset of healthcare marketing. In fact, the modern ‘digital’ approach to healthcare marketing allows you to market your practice and its services, generate patient acquisition, and build a successful healthcare brand — all without even having to necessarily spend on advertising. However, that will depend on many factors such as your overall marketing budget, objectives (increasing brand awareness, improving patient acquisition, or both), competition, your healthcare marketing philosophy, and many other factors. Also, healthcare online advertising is highly cost-effective as it allows for intent-specific advertising with a payment model that requires you to pay for ads only when the targeted patient has seen it and/or interacted with it. As long as your marketing investment is providing considerable profits, it cannot be called “expensive.” Also, the modern “digital” healthcare marketing tactics — even if they require a reasonable investment — will always have a return-on-investment attached. What’s more — most healthcare marketing packages can be easily customized according to the goals you are trying to achieve for your practice.